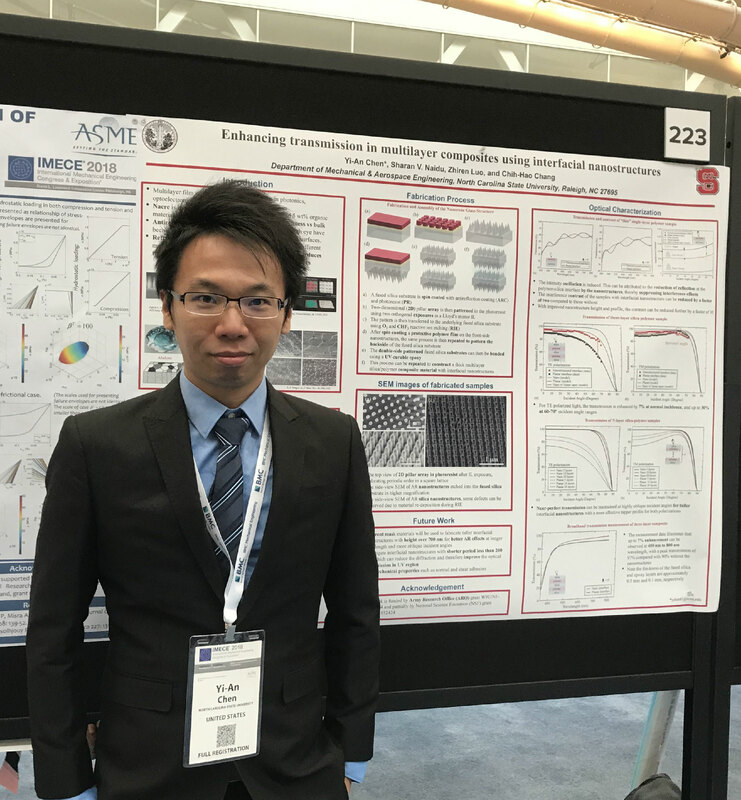 The 2018 International Mechanical Engineering Congress & Exposition (IMECE) was recently held on November 9-15 in Pittsburgh, PA. Yi-An Chen, a MAE PhD student from Prof. Chih-Hao Chang’s group, won the best poster presentation award in the society-wide Micro and Nanotechnology Forum. The paper entitled, “Enhancing transmission in multilayer composites using interfacial nanostructures,” is authored by Yi-An Chen, Sharan Naidu, Zhiren Luo, and Dr. Chih-Hao Chang. Yi-An is a native of Taiwan, where he previously served in the military. He loves painting, literature, and science. He believes science is a kind of art that has the ability to help people in many ways, similar to painting and literature. He takes pleasure in pursuing knowledge in order to explore the unknown and contribute to society.